This cover was carried across the Mediterranean Sea on the Imperial Airways Short Kent S.17 flying boat SATYRUS, G-ABFC, towards Athens when the plane ran out of fuel and was forced to land on the sea off Cape Sunion on 4th March 1933. The plane was towed into the Bay of Phaleron where the mail and passengers were offloaded and the mail taken to Athens where this fine AIRMAIL / biplane /ATHENS Cachet was applied. 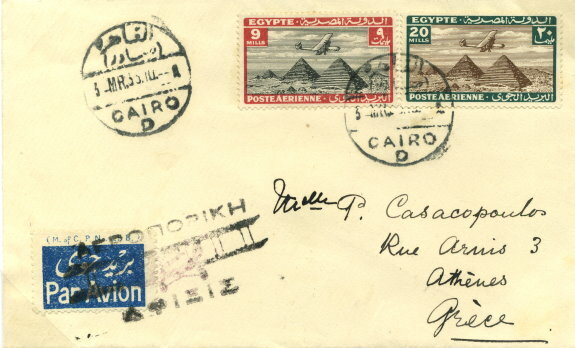 An almost identical cover to the same addressee is used to illustrate Kendall Sandford’s book “AIR CRASH MAIL OF IMPERIAL AIRWAYS AND PREDECESSOR AIRLINES”, which indicates that covers from this accident are very rare.